The Special Meeting of Parry Sound Council on Tuesday night saw tentative agreement on a budget for 2017. You had to be there to understand what was decided. I’ll provide the highlights, but I don’t claim to be a reporter. The official media were conspicuously absent. You have to wonder how council meetings would proceed in the absence of an audience. I am pleased to note that the 2017 Budget does include funding for the recording and online posting of all council meetings, regular and special meetings. I wonder how much ‘editing’ there will be. It would be best if there were none and the viewer could choose to skip over section that are not of interest. Note that these are average figures for a class of properties. Individual taxes will vary from these averages based on individual assessment changes. If you have a home and your assessment went down in the 2016 assessment it’s likely you will be receiving the average Residential tax increase noted above. If your assessment went up you will likely see a slightly higher increase. Please recognize that these are my best estimates of the tax increases. I don’t have access to the Excel spreadsheets that tote up the figures. If you have concerns or questions I suggest you contact Trevor Pinn, the Director of Finance and POA Courts. He probably won’t have final figures but he will be able to provide more informed estimates. The cuts made to the draft budget to get to the tentative 2017 Budget will be the subject of a separate post. There are always surprises aren’t there? Why watch a canned and scripted drama show on television when you can see things evolve in real time at council meetings? And like a good television series the story of Parry Sound municipal politics unfolds from one season to the next. And it’s all unscripted – reality TV at its best. But like British entertainment it’s a bit subtle and doesn’t come with a laugh track. Here are the property assessments underlying the increases as found in the Town of Parry Sound budget presentation of December 13, 2016. 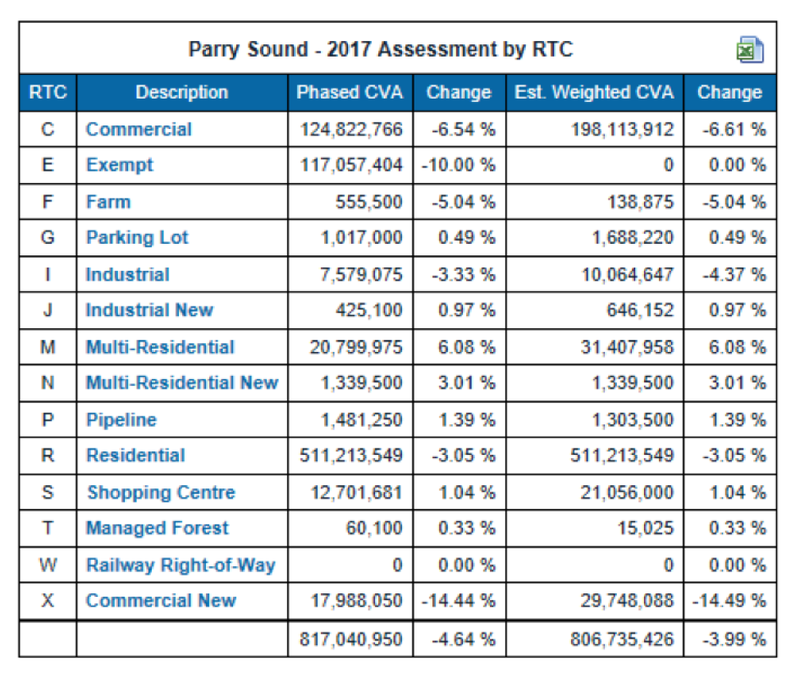 You will note that the total Parry Sound assessment is a little above $800 million. The total assessment for our neighbour Seguin is well above $3 billion.